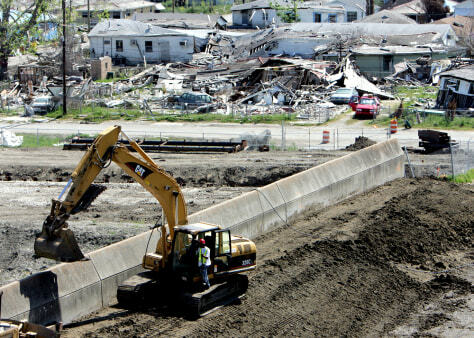 Five years after Katrina, much has been done to help bolster the Gulf Coast against devastation if another Katrina comes along. Still, problems remain, many tied to Mother Nature. Wetlands have been a crucial buffer to hurricanes, helping to slow down the impact of the storms. Louisiana State University Hurricane Center officials said during Katrina, wetlands reduced the storm's water speed from 7 feet per second to 3 feet per second. But Louisiana's wetlands are disappearing for several reasons, including urban development, pipeline construction "natural subsidence" — meaning the land itself is sinking. When Katrina hit, Louisiana was already losing coastal wetlands at a rate of about 25 square miles a year, scientists say. The Army Corps of Engineers is planning to divert freshwater and sediment from the Mississippi River to help give the wetlands new life. But that will take years. 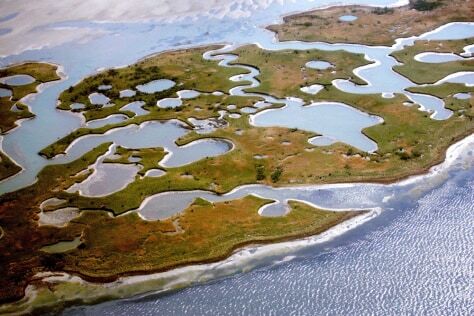 Along with the problem of disappearing wetlands are the region's diminishing delta areas along the Gulf Coast. According to a report in Nature Geoscience last summer, "if sediment loads to the delta remain at current levels — about 50 percent less than on an unobstructed river — more than 3,900 square miles (2.5 million acres) of land will be lost by 2100," writes Jessica Marshall of Discovery.com. 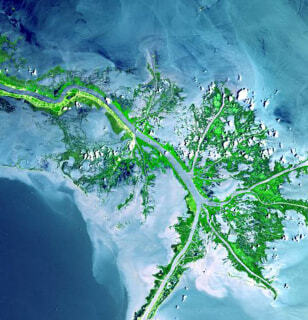 "What needs to be done is a massive program to redirect the river water below New Orleans, to allow the river to really reach the delta," Leonard Bahr, a coastal scientist formerly with the Louisiana governor's office, told Marshall in an interview. New Orleans is below sea level and continuing to sink. "Scientists say it's not only sinking, it’s sliding ever so slowly into the Gulf of Mexico, the Associated Press reported in 2007. According to a report in Geophysical Research Letters, a peer-reviewed journal published by the American Geophysical Union, "the bedrock under heavily populated southeast Louisiana is breaking away at a glacial speed — at the pace fingernails grow," the AP said. "If the land is shifting — even slightly — engineers may need to take that into consideration as they build new levees and draw lines across the coast to identify areas that should and shouldn’t be protected." The sinking, the study said, is being triggered by deep underground faults slipping under the enormous weight of sediment dumped by the Mississippi River. Some scientists believe the loss of land has been expedited by oil and gas extraction during the 20th century. Since the 1930s, more than 2,000 square miles of Louisiana coast has been lost to sinking or erosion. As coastal erosion continues, those residents who live near the shore may face a greater threat of flooding the next time a hurricane like Katrina or worse happens. 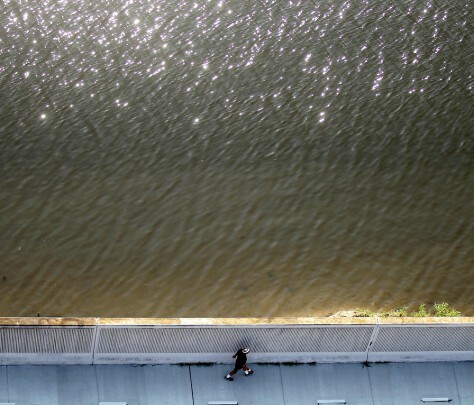 New Orleans' population is about 80 percent of what it was before Katrina, but the allure of living and being near the water is a strong one. Levees and dams are fortresses, but not, as everyone knows, impervious. "Better planning on the floodplain and incentives for businesses to move to high ground" might be cheaper and wiser for all who live in flood-prone areas, William Simpkins, a hydrogeologist at Iowa State University, recently told LiveScience.com. 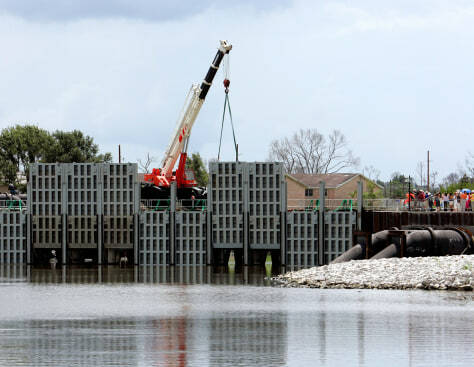 The Army Corps of Engineers has spent more than $14 billion to fix and to upgrade New Orleans' levees, with a completion date of June 2011. Right now, about half the work is finished, the corps says. And if a devastating hurricane happened tomorrow, "We'll be absolutely ready for it," said Army Corps of Engineers communications officer Wade Habshey, who is based in New Orleans. "What we have in place now can withstand a Katrina-level storm." No one really wants to find out, of course. But another concern adds to the worries: Scientists agree that in the future, hurricanes are likely to be fewer but stronger in nature. Some say that is because of global warming; others dispute that.